Advance Auto Trading Limited Partnership or AVAT offers quality and competitive aftermarket / replacement auto spare parts to our clients for alternative choice when require. Variety of auto spare parts can be found for aftermarket replacment such as the following. 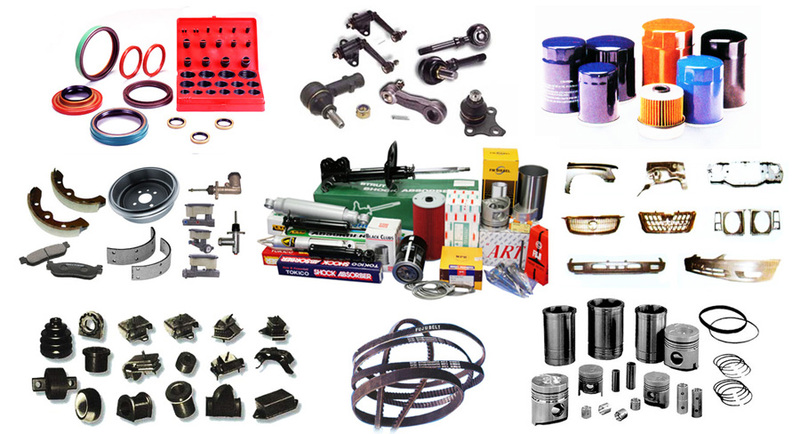 Suspension Parts : Ball Joints, Tie Rod Ends, Idler Arms, Pitman Arms, etc. Rubber Parts : O-ring, Belts, Bushes, Engine Mountings, Center Bearings, Oil Seals, etc. Body Parts : Front Bumpers, Fenders, Bonnets, Doors, Rear Bumpers, etc. Engine Parts : Cables, Filters, Pistons, Piston Liners, Piston Rings, Water Pumps, Generators, Gaskets, etc. Brake Parts : Brake Shoes, Brake Disc Pads, Clutch Discs, Clutch Covers Bake Drums, etc. Many of our aftermarket replacement auto spare parts are manufactured in Thailand and others are OEM replacement from authorised distributors for our market. Consolidating all the aftermarket auto spare parts will help those clients who need for the alternation of more competitive prices with selective quality products we supply. We usually require the following detail in order to accurately supply our clients the correct auto spare parts they need. Quantity Requirement (This will assist us to determine the best prices and estimation of the delivery lead-time.